Wood betony is native to Europe, and was once a revered plant for its many medicinal properties. Betony is warming, slightly bitter and astringent. Nowadays it is used in combination with other nerviness for all sorts of nervous system support. Check out A Modern Herbal for more information on the long historical usage of this plant. 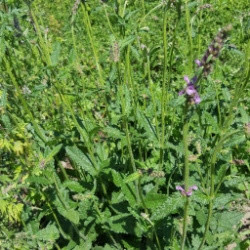 Wood betony is also used for digestive issues by restoring tone to the digestive tissues, as well as respiratory complaints, headaches, and is believed to lower blood pressure, among many other attributes. Jim McDonald has an excellent write up about it on his website. A tea of wood betony can be made by steeping 1 to 2 tsp dried leaf and flower in a cup of water for 15 minutes. One or two cups of this tea can be drunk per day. You can also tincture the aerial parts that you receive in your bunch. Cautions/Contraindications: Generally regarded as safe.